$299 price tag matches other Black Friday bundles from Microsoft. It’s officially that time of year when companies like Sony attempt to get their current consoles flying off the shelf. This year, there are a number of different bundles for both the PS4 and the Xbox One but the newest announced deal features a PS4 bundle with Uncharted: The Nathan Drake Collection included for the grand total of $299. Both console companies have been firing some serious shots across the bow this Holiday season, as they’ve both been offering some serious discounts in order to get their consoles to go out the door. This particular deal was offered up this morning through the official Playstation Twitter account. 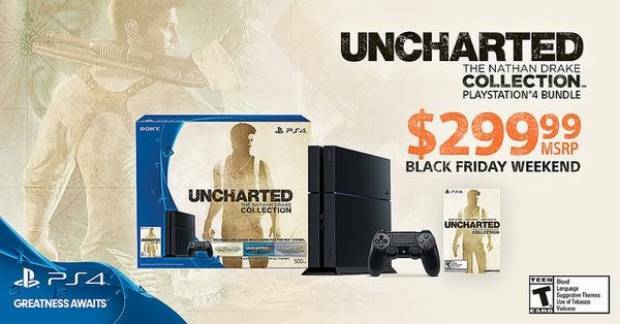 This means that for the $299 price tag, you’ll get the 500GB PS4, as well as the equivalent of three games, considering the Uncharted: Nathan Drake Collection includes the single-player campaigns for Uncharted: Drake’s Fortune, Uncharted 2: Among Thieves, and Uncharted 3: Drake’s Deception. The game was released earlier this Holiday season as a way to sate the appetite of Uncharted fans who are going to have to wait until next spring in order to get the final game in the series, Uncharted 4: A Thief’s End. While this is a really good deal for people who do not have a PS4 yet, it doesn’t quite beat out the one that Microsoft has planned for the Black Friday period. That company is offering up a 1TB Xbox One, as well as two controllers, a copy of Gears of War 4 and Fallout 4. The extra space, as well as two games that are actually new, instead of being remastered probably beats this Uncharted Collection PS4 bundle for value.